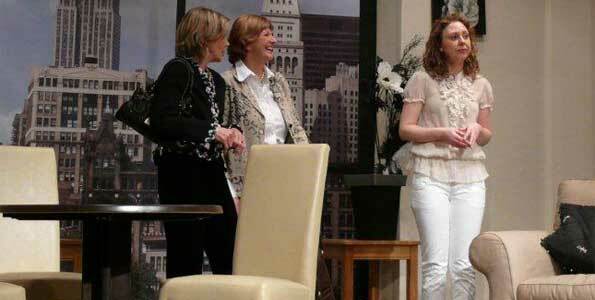 Gainford Drama Club recently took to the stage at The Academy Theatre, Gainford with a production of “Ladies Who Lunch” by Tudor Gates. This intriguing story tells of three ladies in different parts of the world, who all know one another through their husbands, who are among the world”s richest men. Despite living in London, New York and Sydney the ladies meet for lunch on a regular basis to discuss their charity work with Save Our Starving. Amelia, played by Diana Peat, who is based in England, develops a scheme to play the stock market using inside knowledge they pick up from their husbands to raise a hundred million pounds for their charity. Rachel, played by Susannah Carroll, based in New York and Joane, played by Jane Louise Graham, based in Sydney, apprehensively go along with the plan. Investigations begin and the scheme doesn”t have the outcome they were expecting. The set was excellent and transported the audience smoothly around the world. There were a number of prompts on the night I attended, which was a shame, but these can easily be forgiven for the otherwise solid performances throughout. I am certainly looking forward to the next production by Gainford Drama Club.